PRE-ORDER OFFER	Pre-order Sacred 3 and Receive the exclusive Underworld Story DLC, the Z4ngr13f Weapon Spirit, and the Malakhim DLC. Exclusive preorder content also includes the complete soundtrack and an artbook with 100+ pages of content, giving you a unique peek into the game's development. NOTICE: Activation key must be used on a valid Steam account, requires internet connection. 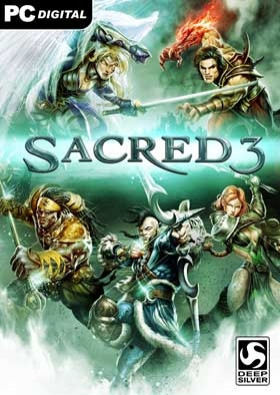 … ABOUT THE GAME	Sacred 3 is an arcade Hack ‘n’ Slash game for up to four players, set in the war for Ancaria. Choose from legendary heroes and fight together against the rise of evil. You will face hordes of grimmocs, brute beasts, legions of mercenaries and undead wizards. Develop your character’s skills and abilities and band together to use powerful co-op abilities and tactics. Victory Is Ours. Glory Is Mine.KEY FEATURES Play as 1 of 5 legendary heroes, each with unique skills and weapons	Master special attacks and quickly decimate hoards of enemies Perform powerful co-op combat arts to defeat epic bosses together Level up and customize your hero, outshine your fellow warriors Equip dynamic weapon spirits to empower your journey	SYSTEM REQUIREMENTS Minimum System Requirements OS: Windows Vista SP2 / 7 / 8 CPU: Intel Pentium D 945 (Dual Core 3400 MHz) / AMD Athlon 64 X2 6000+ (Dual Core 3000 MHz) GPU: Nvidia GeForce GT 610 (1024MB) / ATI Radeon 4770 (512MB) Memory: 2GB Hard Drive: 25 GB available Sound Card: DirectX 9.0c-compatible Recommended System Requirements OS: Windows Vista SP2 / 7 / 8 CPU: Intel Core i5-4430 (Quad Core 3000 MHz) / AMD Phenom 9500 (Quad Core 2200 MHz) GPU: Nvidia GeForce GT 640 (2048MB) / ATI Radeon HD 5570 (1024MB) Memory: 4GB Hard Drive: 25 GB available Sound Card: DirectX 9.0c-compatible © and published 2014 by Koch Media GmbH, Gewerbegebiet 1, 6604 Höfen, Austria. Deep Silver is a division of Koch Media GmbH. Deep Silver, Sacred 3 and their respective logos are trademarks of Koch Media GmbH. Developed by keen games GmbH & Co. KG. Keen games GmbH & Co. KG and their respective logos are trademarks of keen games GmbH & Co. KG. All other trademarks, logos and copyrights are property of their respective owners. All rights reserved.